"It is rare that so fine a music theater team emerges." Winners of the Fred Ebb Award for "excellence in musical theatre songwriting," Thomas Mizer and Curtis Moore are an accomplished writing team whose work has appeared on stages and screens around the world. Their credits include commissions from Lincoln Center and the Williamstown Theater Festival as well as residencies with the Eugene O'Neill Theater Center, the Mercer Writers Colony at Goodspeed Musicals and the American Music Theatre Project at their alma mater, Northwestern University. 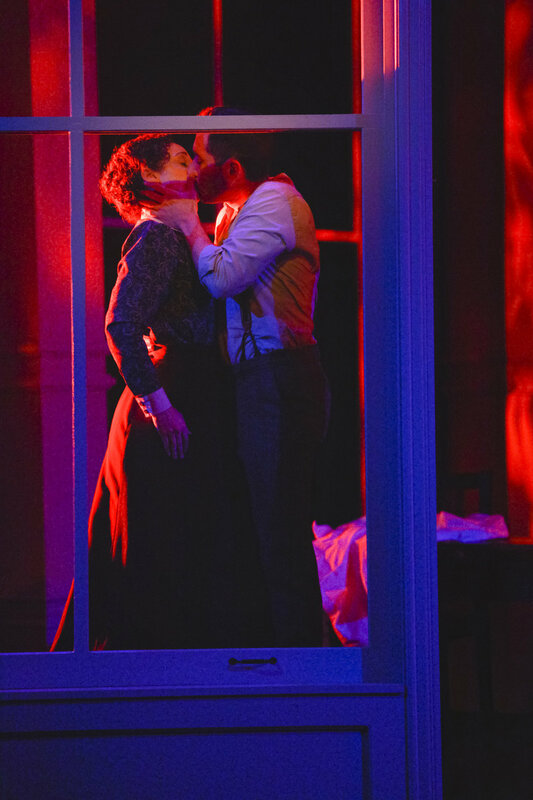 Most recently, their romantic mystery Triangle premiered at TheatreWorks Silicon Valley to rave reviews, with The San Francisco Chronicle calling it “astonishingly successful...rich in melody and emotion.” The production went on to receive six Theatre Bay Area Awards including “Outstanding World Premiere Musical” and the musical was named a 2017 Richard Rodgers Award Finalist by the American Academy of Arts and Letters. They are currently working on four new pieces, including new musicals for Universal Theatrical Group and Grove/Whitman Commissions (producers of Fun Home & The Band’s Visit). On his own, Curtis Moore is a respected composer, songwriter, performer, conductor and producer of film and theater music. His credits include Venice at The Public Theater, Nora Ephron’s Broadway play Lucky Guy starring Tom Hanks, Sam Mendes’ acclaimed world-tour of Richard III, and Todd Solondz’s film Palindromes. For more, go to www.trickybox.com. In addition to his work with Mr. Moore, Thomas Mizer is an award-winning copywriter for national media brands including Comedy Central & Food Network. In a “prior” life as an actor, Thomas appeared Off-Broadway, around the country and on TV in numerous roles, including “Steve” in the original, record-breaking production of Blue’s Clues, Live!. For more, go to www.thomasmizer.com. Two love stories, set in the same New York City building but a hundred years apart, weave together across the century. Soon, long-buried secrets are uncovered and the ghosts of the past begin to influence the future, in this original romantic mystery. Commissioned by the Williamstown Theatre Festival, World Premiere at TheatreWorks Silicon Valley. 2017 Richard Rodgers Award Finalist, winner of 6 Theatre Bay Area Awards including “Outstanding World Premiere Musical” and recipient of 2 SF Bay Area Critics Circle Awards including "Best Production." Get more information and listen to songs from Triangle. An irreverent yet emotional, bluegrass-infused tall tale about the power of diversity, the strength of love and the kick of saloon whiskey. Based on an incredible true story, an ex-slave heads to Montana to find her long-lost best friend, only to discover a town full of cowboys in need of a little lesson in the American Dream. An official mainstage selection of the National Alliance for Musical Theatre’s Festival of New Musicals. Get more information and listen to songs from The Legend of Stagecoach Mary. In this haunting one-act inspired by Argentinian guitar music, a disillusioned writer journeys home for a funeral, without knowing which of his three sisters has died. On his long ride through the night, he is visited by visions of his siblings and must play a dangerous game to determine their fates. New York Premiere at Ensemble Studio Theatre. Get more information and listen to songs from The Bus To Buenos Aires. RT @TimFederle: Life is so much better when you love musicals. We've been busily working away on our brand new musical--and we just turned in the first draft! NAMT "The 46th Minute" Concert to Feature "Triangle"
Want to hear songs from 8 acclaimed, new musicals...including some tunes from our show Triangle? On Stage with "Long Stories Short"
Relive just a bit of the fun and excitement of our big concert with this gallery of images by the amazing Bjorn Bolinder at Find the Light Photography. Keep in touch with us! You can follow us on twitter, facebook, or instagram.